So is this the most beautiful mood board ever created? 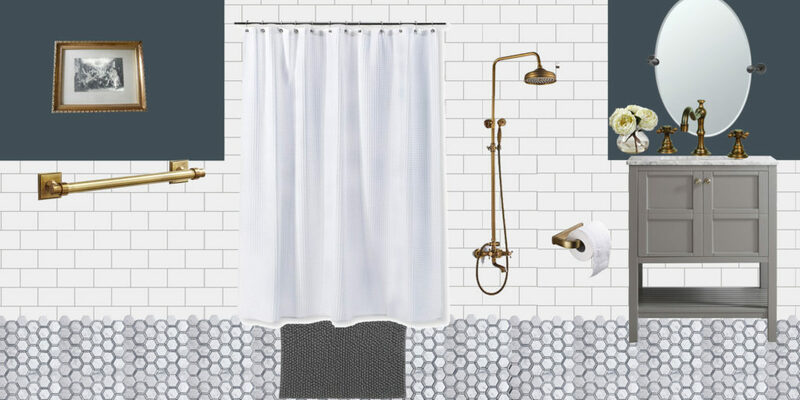 Well, no, but I think that it will give you (and my husband) a good idea of what I’m scheming for our guest bathroom. I’m hoping to create a balance between traditional and modern by using timeless finishes mixed with modern metals and lines. Now that I’m working in real estate, I’ve found that I tend to focus more on balancing design with cost and general appeal. I’m still planning on designing to my our taste but I’m far more hesitant now to pull the trigger on something that’s fairly trendy if it’s on the expensive side or if it’s hard to remove. While some might say that white subway tile is tired, I think that it’s so classic that it’ll never truly be out. Marble and hex shaped penny tiles are also fairly timeless so marrying both styles together for the flooring made total sense. The current bathroom hasn’t been really changed in almost 50 years so I’m hoping that the subway and marble tiles will last another 50 years. 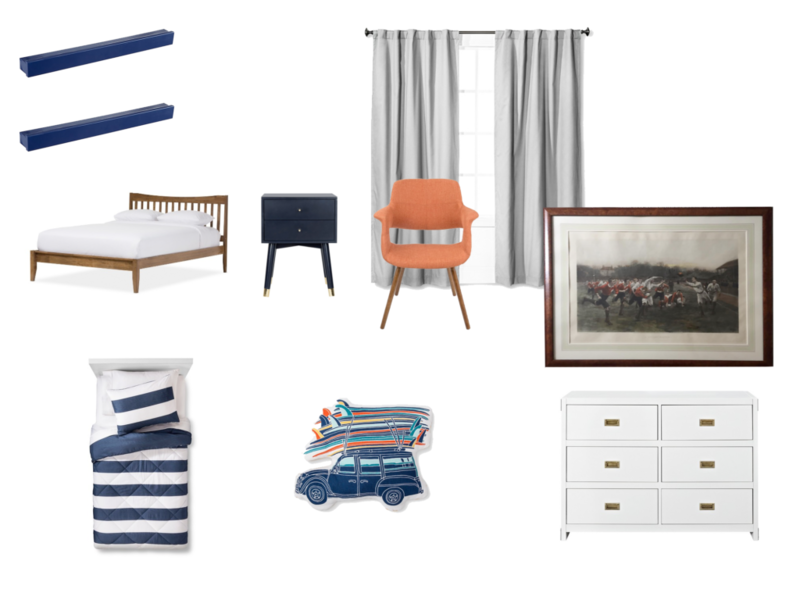 One of the main things that I love about mood boards is that you get to see all your ideas together in one place, hopefully in a cohesive design. While I do like most of the finishes, I’m not quite sure about the mirror and the the paint color. The mirror is simple, but I think that it might be a little too simple and a little too traditional. The paint color is a deep beauty that mostly reminds me of beautiful deep jewel tones, but also kind of reminds me of the 80’s color palettes which doesn’t make me feel joyous. So while I don’t normally love having semi-finished designs floating about, I’m hoping that one or two of you might chime in and let me know what you’re thinking. Anything you love or hate or would absolutely change? Oh Hey! It’s been awhile since I’ve posted anything substantial besides a few mood boards but I just felt like I should pop in and say something. I’m hoping to be around a little bit more going forward, chatting about this and that, telling you my thoughts on design, and just about anything else that makes my heart happy. I’m hoping that by showing up more, I’ll have a little more focus in my life and live with a little more purpose. It struck me how much I’ve wandered lately when someone asked me what I do, and I couldn’t answer them. It’s not because I haven’t done anything but more like I’ve done too many things and the problem with that is that I feel like when you focus in so many different areas, you never really fully focus on anything. If you think I’m being ridiculous, let me tell you that this year alone I’ve designed and worked on some interior design projects, got my real estate license (and got a real estate job), taken on another Internet marketing client, worked on and somewhat abandoned a modest clothing site, volunteered with refugees for church, volunteered with different refugees for Junior League, and painted and sold some artwork. See, too much. I also hope that I’ll be able to document the awesome part of my life- getting to travel and see awesome places in the world, decorating my house, and hanging out with some of the most awesome humans around. I hope there might be a few people following along for the journey- thanks for joining me. 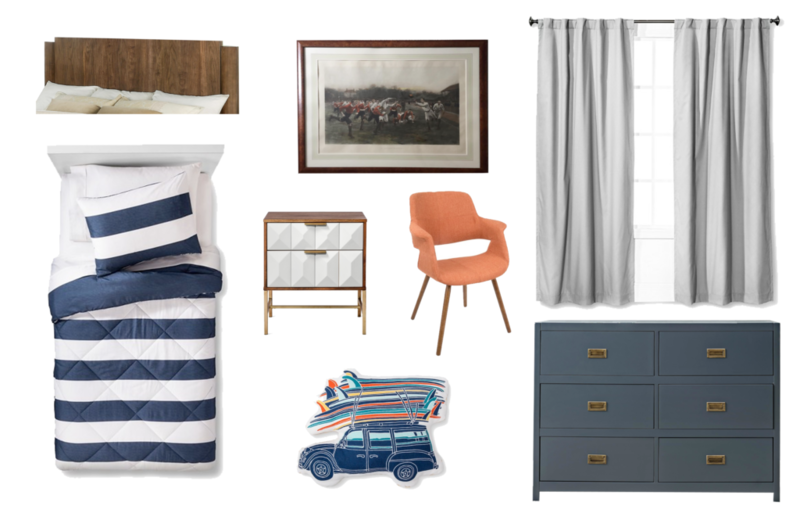 This is the first draft- we decided against the headboard and then the nightstand went out of stock so we switched things up by adding a full bed (instead of just a headboard), new nightstand, and new dresser color. We also added hanging book ledges for the wall near his bed to encourage reading. Still a modern and boyish feel with just a few slight tweaks to a few items. All Target items at additional 10% with Promo code “HOME” at checkout! I know that I’ve been a little MIA lately, but life has been busy around these parts lately and my other project has kept me glued to my computer. Besides working on Covered Style, I’ve also been having fun helping a friend with her house remodel. She has beautiful taste and her house is going to be gorgeous. I honestly can’t wait to show you all of the rooms that we’re designed and put together. 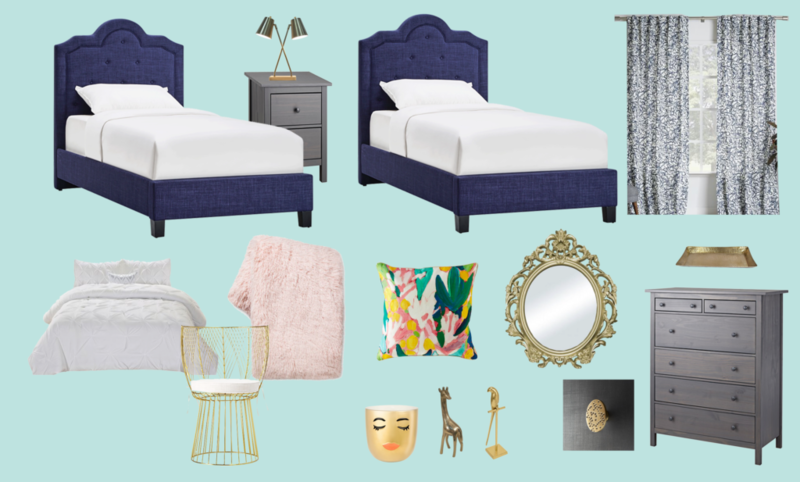 Enter the chic femme bedroom and a whole house full of gorgeous rooms! 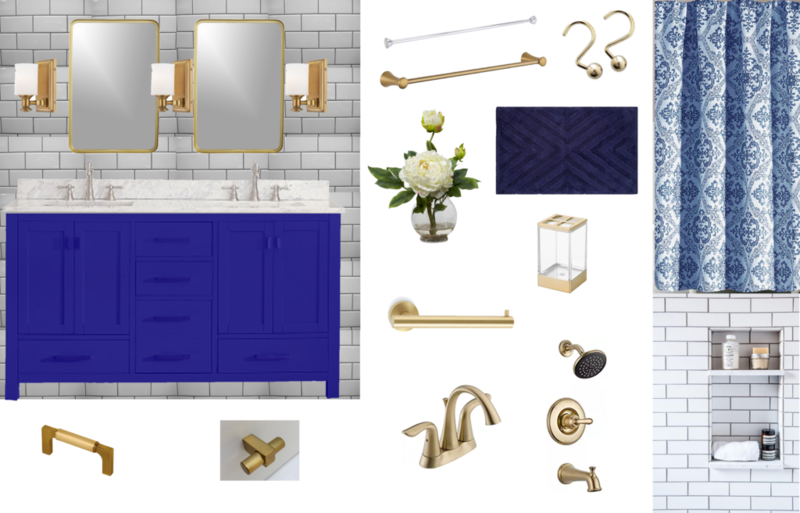 Unfortunately, the house is still very much under construction, like the flooring and cabinets aren’t installed yet, so I thought that I’d post some of the moodboards that I put together. My client wanted her bedroom to be modern, yet feminine so we’re balancing the crisp clean feel of the black and white look while still keeping it soft, light, and chic. So what’s your favorite piece? 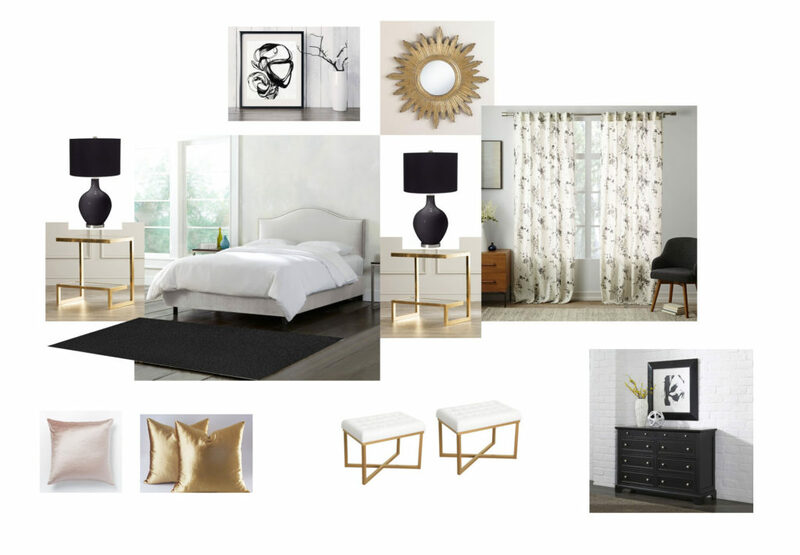 Do you love the more stark, modern look or do you lean more towards a warmer, cozier bedroom? You know I’d love to hear our thoughts! I’m going to let you all in on a little secret: You can absolutely afford original, beautiful art. You really can. For most of us out there, we can’t afford art gallery prices. That’s OK. You just need to know where to look and when to buy. 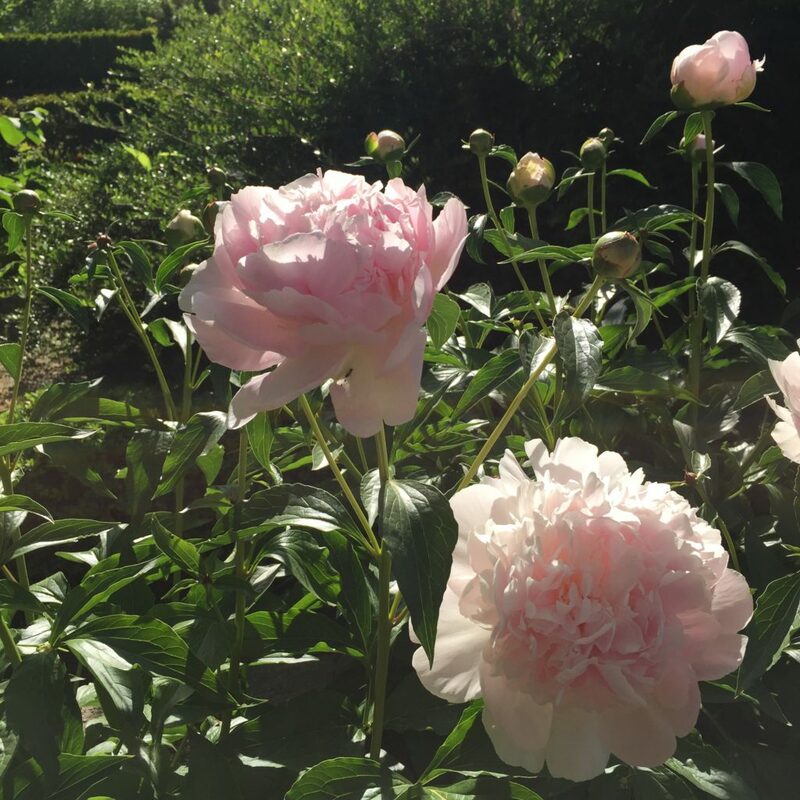 I’ve hesitated to write this piece because I’m giving away some of my secrets and possibly adding competition, but fortunately my desire to help outweighs my desire to look expensive and posh. So let’s dive in before I change my mind and delete this whole post. Estate sales are THE best place to find art, in my opinion. Let me give you an example to prove my point. The painting above is a magnificent original oil by a renowned English artist, set in an antique gilded frame. His work runs $2-5k. This painting is a bit smaller so I’m guessing it would be on the lower end of that range, but who knows. 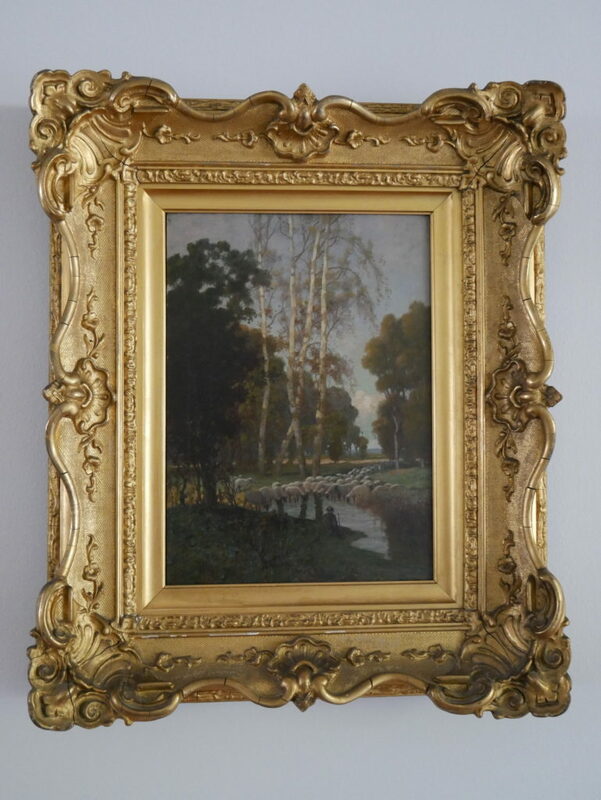 The frame, not original to the painting, is much older and worth several hundred dollars as well. For simplicity’s sake, let’s just estimate the value on the low end- $3,000. Now my favorite part begins. Guess how much I paid for it?? What did you guess? If you guesses $300, you’d be correct. Yep, paid literally one tenth of the lower-end estimated value. How did I do that? Well, first of all, you always have to remember that estate sale companies are interested in liquidating everything. That’s what they’re paid to do. Follow a few simple rules I’ve developed and you’ll get an amazing deal. Know when to go. Try to be there the first day of the sale 30 minutes before opening, if possible. Many of the best deals will be snatched up within the first 5 minutes. I know that it sounds crazy, but it’s totally true. I’ve kicked myself quite a few times for being just a little bit late and missing out on gorgeous pieces. Always go the last day of the sale as well, and again, right when they open. Usually the last day of the sale will be 50 to 75% off of original prices. If something was too expensive for you the first day, it might still be there the last day, and at a much more reasonable price. Know where to go. Estatesales.net is probably one of my most visited sites if you were to look at my browser history. The site allows you to punch in your zip code and then shows you all estate sales within a hundred miles. You can click on the sales and view pictures, descriptions, sale times, and even GoogleMaps locations for each sale. It’s golden. Bookmark it. Now. Know what to look for. Sometimes the best artwork is above the mantel but most of the time, it’s not. 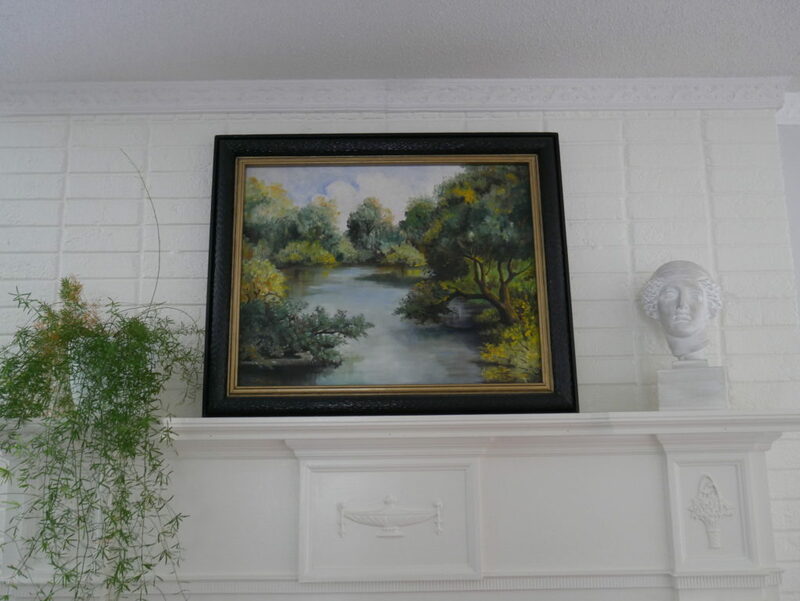 I’m always surprised how often I see over-priced reproductions on the mantel while beautiful original art is in the bedroom, dining room, or other spaces. 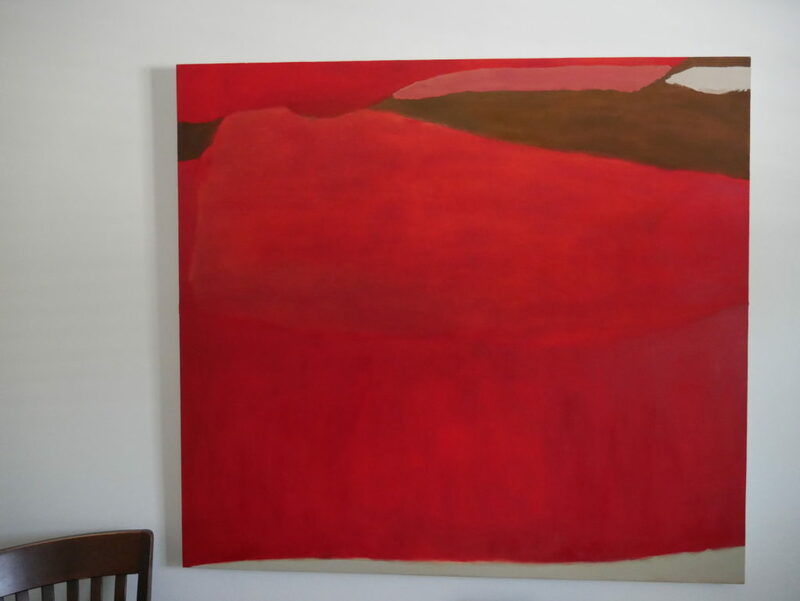 That huge red painting above is almost 5 ft by 5 ft and originally quite expensive. I found it in a super traditional home in their finished basement closet. My husband would murder me if I told people how much we paid for it so I’ll just say this: pennies on the dollar. It wasn’t the first and it won’t be the last time I’ll buy beautiful work that I found in a storage area. So check all over the house, not just the main common areas. Remember that liquidating is their business and don’t forget to negotiate. Estate sale companies want the house to be nearly clear when the sale concludes. Many times they’ll donate unsold cheaper items and ship expensive ones to auction houses. It’s extra work and cuts down on their profits. Knowing this, you can and should negotiate on the last day of the sale. Remember that first oil painting? We negotiated the price down to 75% off original asking price because it wasn’t moving and the sale was ending. He won because he saved auction house fees and we won for obvious reasons. Offer a reasonable price and wait for an answer, sometimes they won’t budge but 90% of the time they will. Make friends with the estate sale company owner. If you’re going weekly or even monthly, you’ll start to see the same people work the sales. Find out who the company owner is and make friends. I’ve seen people get crazy deals because they’re frequent customers who are kind to the people who work there. It always pays to be kind. The painting above our mantel was the first original piece of art I ever purchased and I found it in antique mall. Hidden away near the end of the booth, this beauty hung in the most awful colored frame imaginable. Beige-y puke is the color that comes to mind. But we loved that painting and we decided not to let the frame stop us. The frame has since changed and we’re even more glad that we purchased this large original, Texas oil painting for less than $100. We got lucky, but we also followed some of our own rules to score this beauty. Something to keep in mind is that while some of the rules can overlap, buying at an antique store is very different than buying from an estate sale. Margins and personalities are VERY different as well as retail vs. liquidation setting. The differences don’t have to keep you from scoring that perfect piece though. Some of my favorite finds have been at antique stores. Look for the odd man out. Many antique dealers specialize in certain types of antiques, or even just a certain type of piece. Much like car dealers, you’ll get the best deal on what they don’t specialize in. You’ll find the best price on a Honda at the BMW, just as you’ll often find the best deal on American art in a booth with mostly European imports. 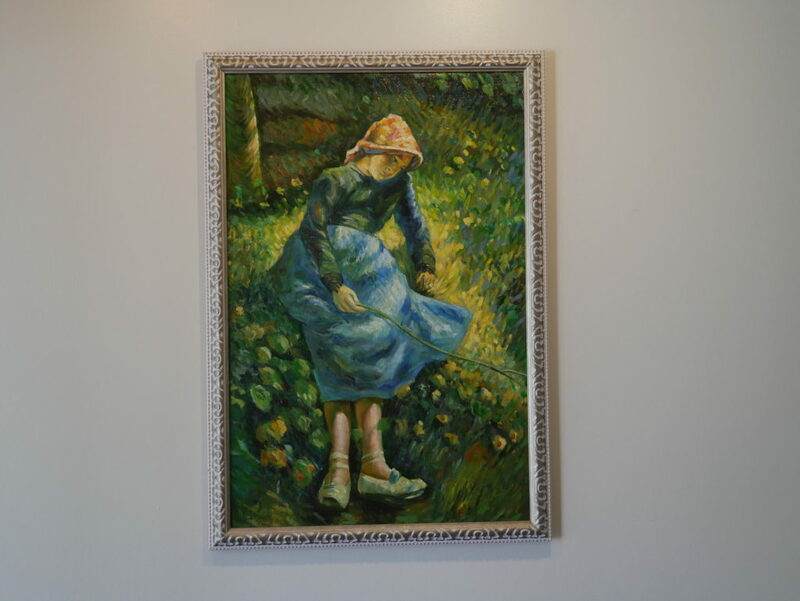 The Renoir-esque painting above was found in a store that is filled with Asian art and pottery. I’m not sure how she came upon this painting, but I do know that she gave it to us for a steal! Look beyond the frame and surrounding. I chatted about this before about frames but seriously, don’t let them get you down. You can change the frame. And if that is cost prohibitive due to size, remember than a can of paint can change the whole look and feel of the piece. Also don’t forget to imagine the piece in your home vs the booth. The store might be gross, have funky painted walls, or be surrounded by clashing artwork. Don’t let that distract you. Good art is good art and needs a loving home. Preferably yours. Always be complimentary. 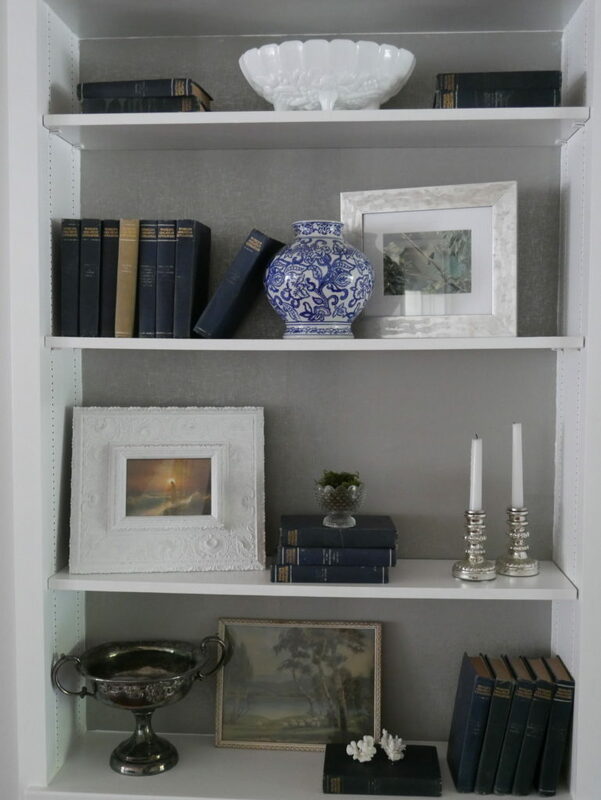 Estate sale companies sell other peoples things while antique stores sell curated pieces. Some things are acquired by chance but most of the time, they have been painstakingly hunted, cleaned, and priced. While you don’t have to love everything in the store, if you’re serious about buying anything, make sure you keep any less than flattering opinions to yourself. Love something in the store? Tell them. It’s nice to hear and it’ll soften up even the most crusty owners. Be honest about what you’ll pay. You might find a gem that is such a good deal, you’ll gladly pay asking price. Many times however, you’d like a better price and that’s totally fine. 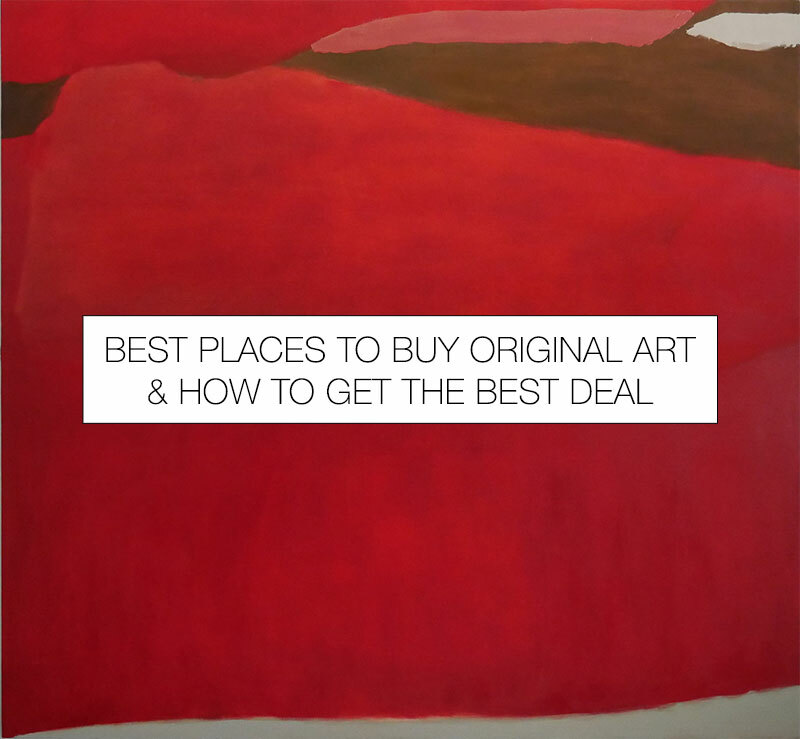 Tell the owner that you love the piece but that you’d like to talk about the price. Then suggest a price, but make sure it’s not extremely lower than the original listed price. The last thing you want to do is to ‘insult’ them by suggesting a price that is too low- 25-30% off is about all I’d ask. Anything more than that and you might make them less inclined to do any business with you. Bundle, bundle, bundle! If you like multiple items, suggest buying all of them for a set price. I’ve found that prices are far more negotiable if you buy more than one item. The additional plus side is that you get to bring home multiple beauties as well. I hope that you found some advice that will work for you. I’m sure that there are other tips that work (and I’d love to hear about them in the comments) but these are the ones that have consistently worked for me time and time again. And thanks for your patience as I’ve been MIA. I’ll have more details on why soon, but my life has been busy with my other project and a fun experiment. So we did get a new kitchen but while I’m finishing up puttying a few spots before I reveal it, I thought you’d like to know what I’ve been up to since I last posted. I’ve started a site that curates modest, fashionable dresses that women actually want to wear. So if you’d like, head over to my new site www.coveredstyle.com to see if there’s anything there that tickles your fancy. Raise your hand if you still haven’t purchased a valentines gift for that special guy in your life. I know that I can’t see any of you but I’d like to imagine I’m not the only one with my hand in the air right now. When I’m feeling that desperation that certainly accompanies holiday gift procrastination, I like to turn to my happy place, which like most women in my demographic is Target. That magical place has saved my bacon more times than I can count. 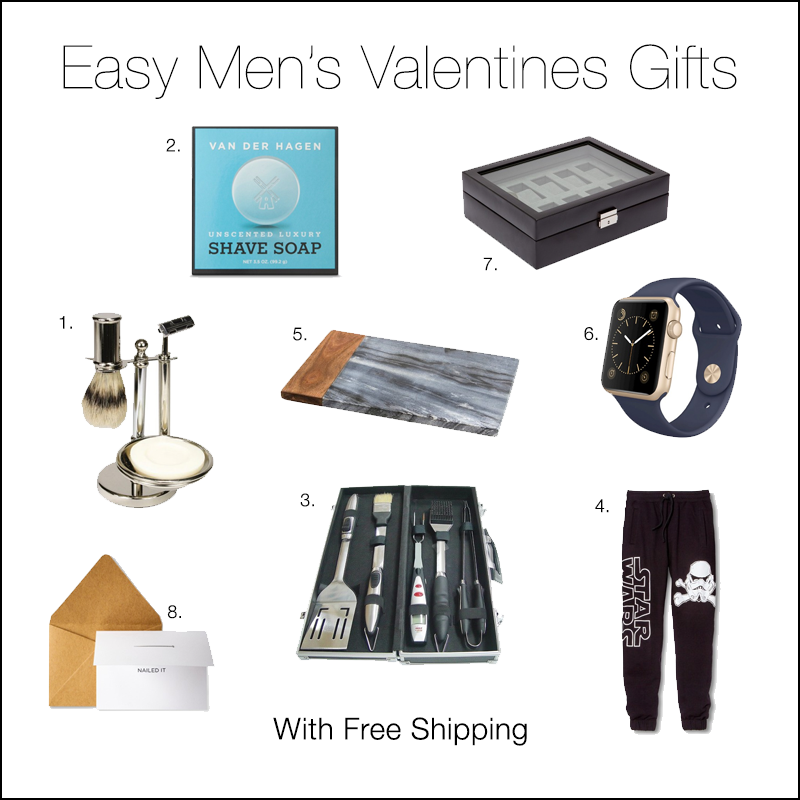 So here’s a roundup of gift ideas that I’m sure nearly any man would like. They’re an easy win and won’t break the bank that’s probably still recovering from Christmas. And with your handy dandy RED card you don’t even have to pay for shipping! I’m tempted to buy that stone cutting board for my husband but both he and I would know that it’d really be for me. No mistake. That shaving kit would be a clear gift for just him and would fancy up our bathroom vanity, which is never a bad thing. Anyone else out there want to confess that they haven’t purchased anything for their S.O. yet? Bueller? Anyone? How cute is he? And how equally strange is that title? Well, we had an interesting night last night. It started off like any other night with dinner at our fav pho place and a trip to Target (who else goes multiple times a week? I digress…). We were just getting home when our friends call to say they found this cute little guy chasing cars and after an exhaustive search, were unable to locate his family. I was thinking “sad story… what do you want me to do?” like any semi-reasonable person when my friend asked me to watch him and help find his family. That’s when it all clicked. You see, I’ve been a little down on myself lately because I’ve been feeling like I’m not setting and achieving enough goals. I was bathed in the waters of Franklin Covey and 7 Habits and was truly converted. But like with most things, after a while your conviction can fade and mine was no exception. 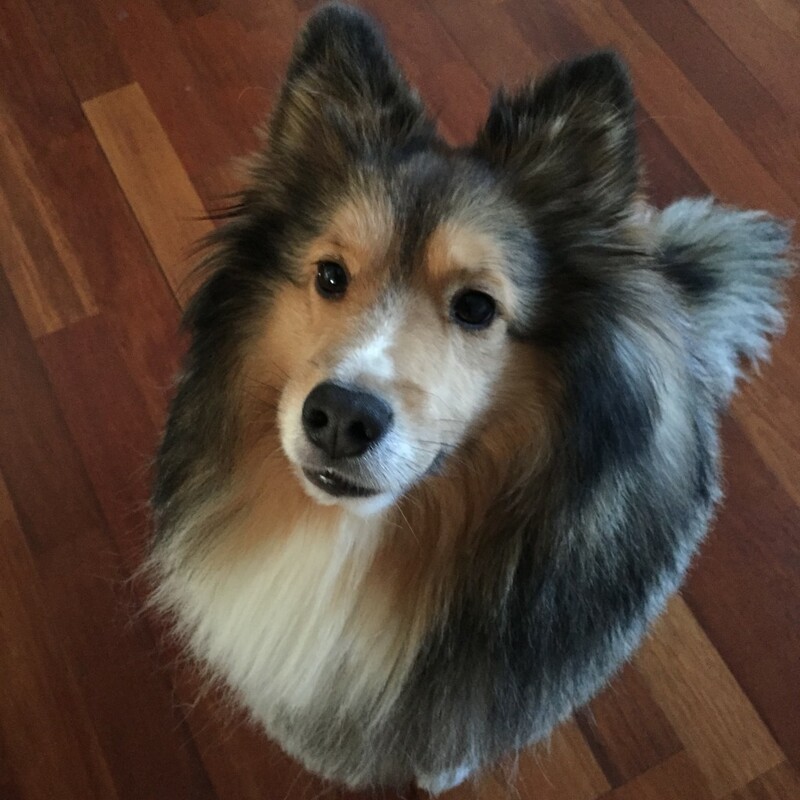 But then this dog. You may remember back on my birthday last year I wrote a list of 30 goals before 30 and one of them was to foster a dog. I thought that this would be an easy one considering my friend runs a rescue and Austin is a no-kill city but heavens, the timing was always off. It was not for lack of trying, believe me(! ), but I felt like life was constantly in the way and sending me the same message my husband was: Not now! That can be incredibly frustrating when you’re trying to achieve a goal that you feel like is a worthy and fairly selfless act. So last night, after much cajoling and eventual husband acquiescing, this little guy came to stay and play with us. I wish I had videoed him because he has the most adorable little gait and walks like a little gentleman. This is where the whole Gaylord thing comes in. We couldn’t not give him some sort of name and after scrolling through other fancy British sounding names, he somewhat responded to Gaylord and it stuck. I’d like to say that it was all sunshine and roses but there was crying on his part and a slight allergy attack on mine. Thankfully we both made it and I awoke from my allergy med-induced sleep to texts and calls from his owner. All the coughing and watery eyes were worth it because watching Gaylord (whose real name is Perry) see his owner again was the closest I’ve ever come to witnessing one of those touching reunification stories you see on Hallmark movies. Definitely my feel-good moment for the week. And selfishly, it feels like I can cross off “fostering a dog” from my list. It might not be considered fostering 100% but I feel like this was the universe lobbing me a slow pitch, letting me get an easy hit. And because my friends (and Google) are so awesome and it fit in so well with my baseball analogy, I feel like I have to share with you that there is actually a Hall of Famer named Gaylord Perry. He was a renowned cheater but let’s save that story for another day and keep our eye on the ball, er story. So there’s my story on how being open and ready to help can also help you. It’s totally a cheesy trope but they exist for a reason, right? And getting to call an adorable little animal Gaylord was hilarious and almost as satisfying as completing one of my goals.